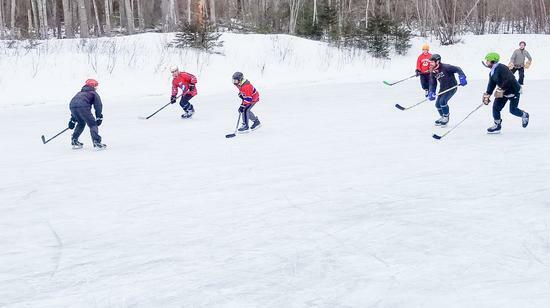 Years of ‘pick-up’ ice hockey games, played on winter evenings and weekends wherever a healthy sheet of ice could be found, led to the Peninsula Skating Association holding its annual Peninsula Pond Hockey Tournament on Saturday, February 2, at the Peninsula Skating Rink in Blue Hill. 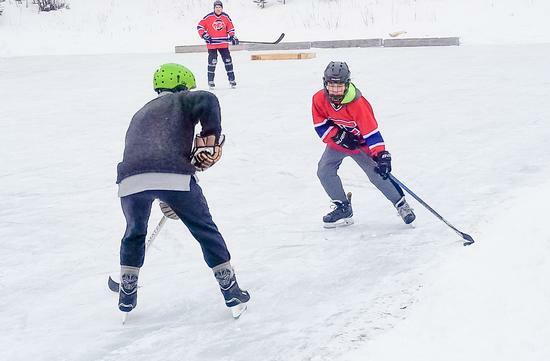 Teams Boulet, Boulet and Devorable take to the ice in the 2019 Peninsula Pond Hockey Championship held at the Peninsula Skating Rink on February 2. River Plouffe-Vogel challenges 14-year old Zane Boulet along the edge as Mike Boulet looks on.